For weeks my friend Alannah and I have been conducting trial runs to prepare for our first catering gig as a duo. 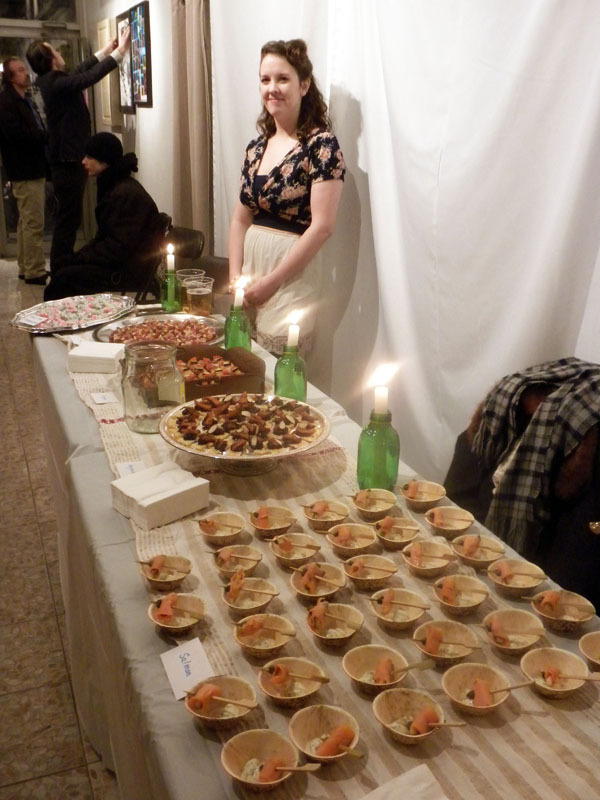 Our friend Kat helped organize the event, called A Hoi Polloi, an artists exhibit at Creatures Creating gallery. 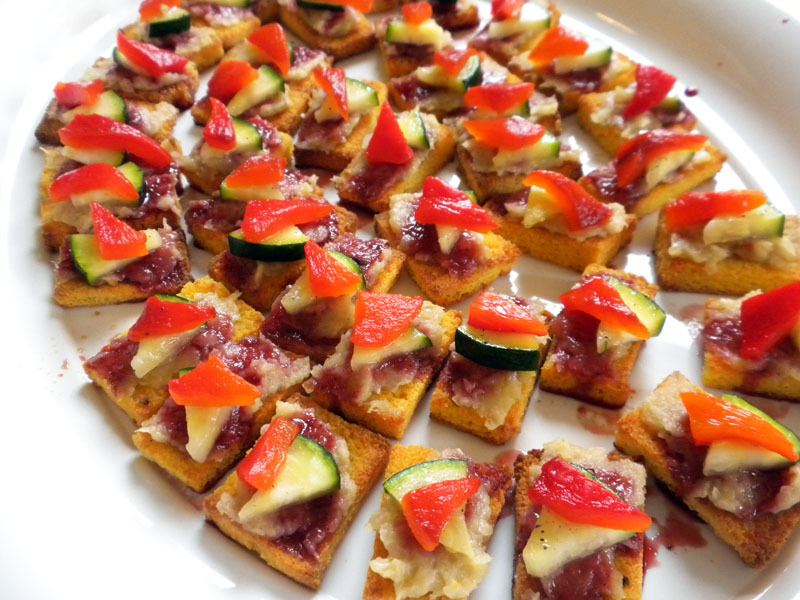 Alannah is a culinary arts student at George Brown, and with her skills we created five hors d'oeuvres: one meat, fish, vegetarian, vegan and dessert. With over 200 guests, bands, and beautiful creations covering the walls, four of our dishes were gobbled up in two hours. We gradually brought out dessert, giving guests a rowdy demonstration on how to shoot 'em back. Tomatoes stuffed with basil pesto, red wine infused cheddar and prosciutto roses were a favourite of the night because of their quaint, elegant package, easily popped in the mouth. They are literally explosions of flavour, but their composition took diligence. 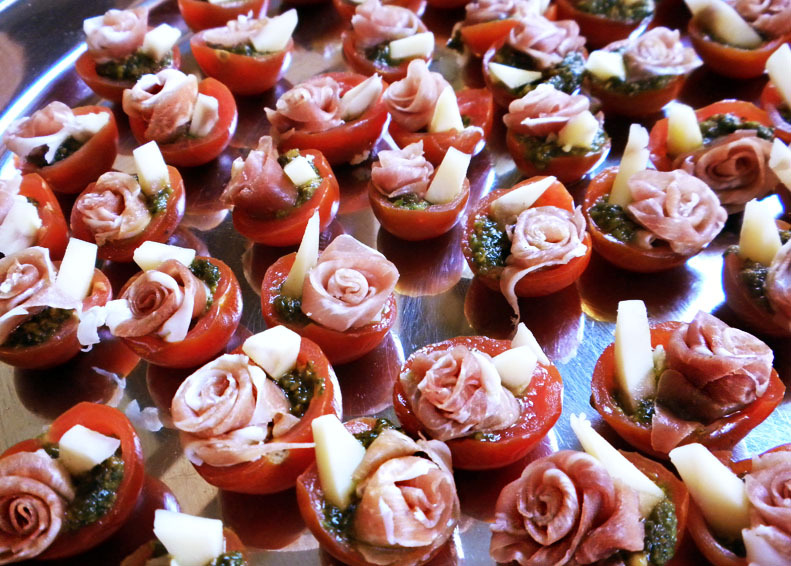 Alannah spent close to three hours blending herbs, scooping tomatoes, and rolling the thin-sliced prosciutto to make these little bites from heaven. In a food processor, blend all of the pesto ingredients until it creates a thick paste. This can be a done a few days beforehand. If you want the pesto to remain its brightest green, store it covered in the fridge for no longer than one or two days. Cut the tomatoes in half and scoop out the juice and seeds using a small paring knife and spoon. If you're using small tomatoes like these, add about a quarter teaspoon of pesto so it won't overflow when stuffed. Cut the cheese into miniature wedges. As for rolling the prosciutto, that's up to your own skill. 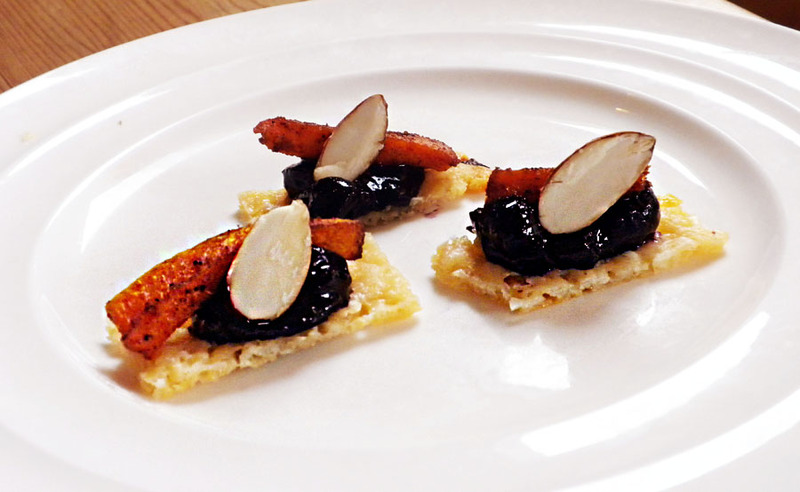 As a vegan dish we made vegan cornbread crisps topped with caramelized onion puree, spicy pomegranate syrup, pan seared zucchini and roasted red pepper. 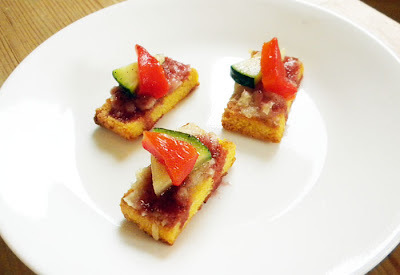 The cornbread made an excellent base for this hors d'oeuvre because it didn't steal the sweet, tangy taste of the syrup and the natural flavours of the veggies. It was a dish that was easy to please all, although it does taste better served warm I thought. Bake the cornbread the night before so it has enough time to cool off before you cut them up to make crisps. To make, combine all wet ingredients in one bowl and the dry in another. Stir and combine until there are no lumps in the batter. Add to a greased loaf pan for 40 minutes. Also, don't over estimate the number of crisps you will get from each loaf. We made 3 loaves to get close to 150 crisps. Once the loaf has cooled, cut the outside crust off of the whole loaf, this will make the edges of your crisps very clean-cut. Cut it into slices about half and inch thick, then cut each slice into three pieces. Spread them out on a greased baking pan and bake at 350 degrees celsius for about 20 minutes, or until the bottom side is golden brown. Flip the slices and repeat. As I mentioned its better to do this right before serving so they are warm and crispy. For the syrup, cut your pomegranate in half and remove the seeds, put triple sec, seeds, crushed clove and split chili in a small saucepan. Allow to simmer to cook some of the alcohol out. Add water once the liquid in the saucepan has reduced. Add sugar to help in its syrupy consistency. We added a touch of honey to ours. Then strain the liquid and reduce more for desired consistency. 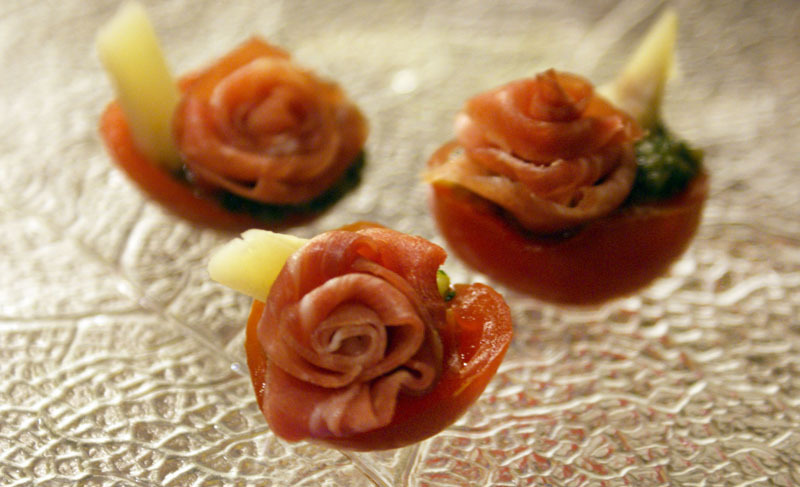 The salmon dish exudes a salty, pickled flavour since we wrapped our own pickled cucumber with Nanuk smoked salmon and skewered them with capers. You have to really like that sour taste, and surprisingly many people did. 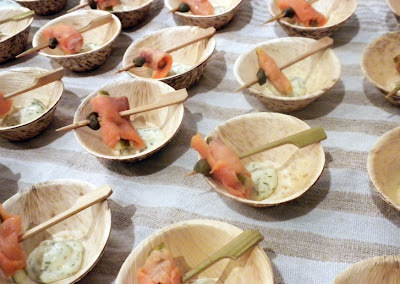 We paired it with lemon dill aioli that provided a creamy and suiting compliment, served in petite wooden bowls. Before you do anything prepare the cucumber the night before, see pickled cucumber. After you've drained them, cut each piece into 3 equal pieces. Store the salmon in the fridge until you're ready to use. I personally like this brand of salmon the best. It's a little bit delicate but it has a nice smokey and salty taste. As you carefully separate each piece cut it into roughly 3 pieces. You want a piece big enough that it will roll around each cucumber piece, but it's okay if they stick out at the sides, you want people to see what's inside. Using a toothpick or a skewer like ours, pierce the wrapped cucumber through its center. Be careful though, the salmon may fall apart. 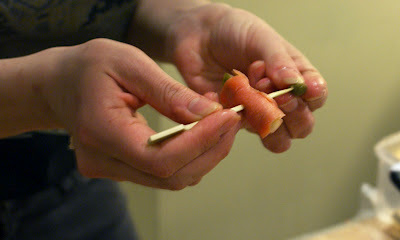 Don't skewer it all the way to the center either, leave it close to the end so it's easy to dip. Lastly, skewer a caper from its base (you can see its small stem if you look close enough). As for the aioli, add your desired amount of mayo in a food processor and add the rest of the ingredients all to taste. Crush the garlic before you add though. The result should be a slight garlic and lemon taste with a strong taste of dill. Our vegetarian dish was another taste tantalizer. On the bottom is a crisp purely made of freshly grated parmesan cheese. This isn't like the stuff you buy pre-shredded. It cost $24 for two chunks and is probably one of the oldest tasting cheese. This, paired with slightly tart blueberry compote, spicy roasted butternut squash and an almond, completed a polygamy of flavours. The first thing you'll want to do is make the compote and the squash. Add all of the blueberries to a pot and keep them uncovered on very low heat, stirring occasionally. As time permits, the juices will be released and reduce into a thick, jam-like mixture. As the juices begin to thicken, add maple syrup, nutmeg, and cinnamon to taste. The result will be a sweet, yet slightly tart compote, thick enough to spread and good enough to eat! Now let it cool. While the blueberries are on the stove you can begin preparing the squash. Peel your squash, cut it in half and remove the seeds. Depending on how much you are making you may only need to use one half of it. To achieve triangular pieces, cut the half of the squash lengthwise into half inch pieces. Cut these long pieces diagonally into small triangle shapes. If this is hard to follow then just experiment, any shape will work. In a bowl toss your pieces with the oil and spices. Lay them out on a greased baking sheet and bake at 400 degrees for about 10 minutes. They won't take long to bake and you want the edges to look dark brown and roasted, but not burnt. 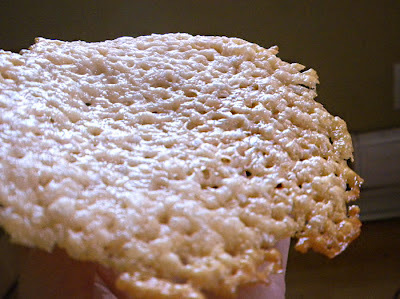 After a lot of experimenting we discovered the trick to making parmesan crisps – parchment paper. All you have to do is buy a block of fresh parmesan (I recommend from a specialty cheese shop), shred it up (minus the rind), spread it out evenly onto parchment paper (NOT wax paper, it will stick surprisingly), and bake at 350 degrees until the cheese melts and the edges begin to brown (about 5-7 minutes). Peel from the parchment, then break it up into chunks or cut into desired sized pieces, do this while it is still slightly warm or it will become crumbly. The result will be a very sharp tasting crisp, yum. The dessert shots were as celebratory as they look. We brought them out in between bands, pounding them on the table and showing guests how to smack their bottoms to get the filling in their mouth. Although this seems like effort, each shot delivers reward. At the bottom is homemade mascarpone mixed with berries and honey, sitting in a splash of pomegranate Triple Sec, topped with raspberries blooming with icing I like to call heavenly cream. Prepare the mascarpone at least 2 nights before you make the dessert, see mascarpone. 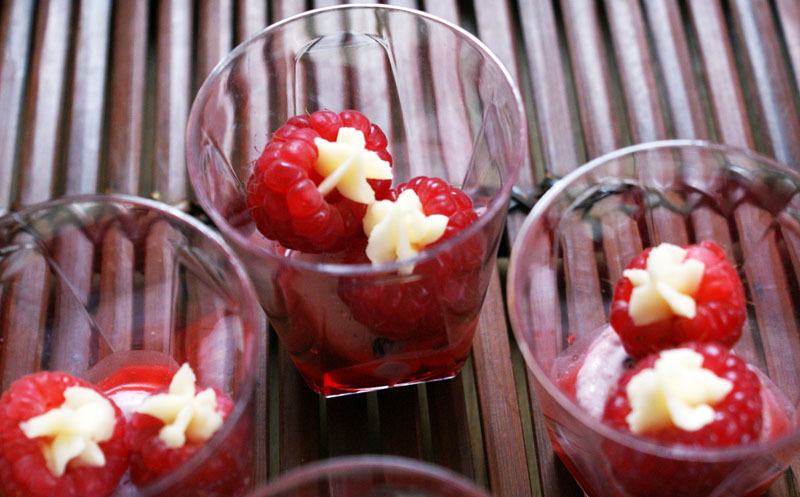 Mix the mascarpone with the berries and honey to your desired taste. If you want it sweeter add more honey, if you want it tart add more berries. The more of both ingredients you add the less buttery it will taste. I recommend homemade mascarpone over store bought because it is 100 times more creamier, and quite literally, heavenly. I find that store bought has an obvious manufactured taste to it and leaves a weird after-taste that I can't quite pin down, which is a bad enough sign as it is. As for the icing, see cream cheese icing. Mix half mascarpone, and half icing and you will get a cheesy, creamy icing. If you want it to taste more creamy just add more mascarpone. To get the flower effect I used an icing gun with the nozzle that has jagged, inward edges. To prepare the whole ensemble, add the Triple Sec in the shot glass first. We filled it about a 1/4 inch high, but that's because our resources were limited. This amount with a spoonful of mascarpone creates a creamy, fruity flavour with a touch of alcohol to taste.